As soon as we moved into our new house back in August 2011, I knew which room I wanted to decorate first. 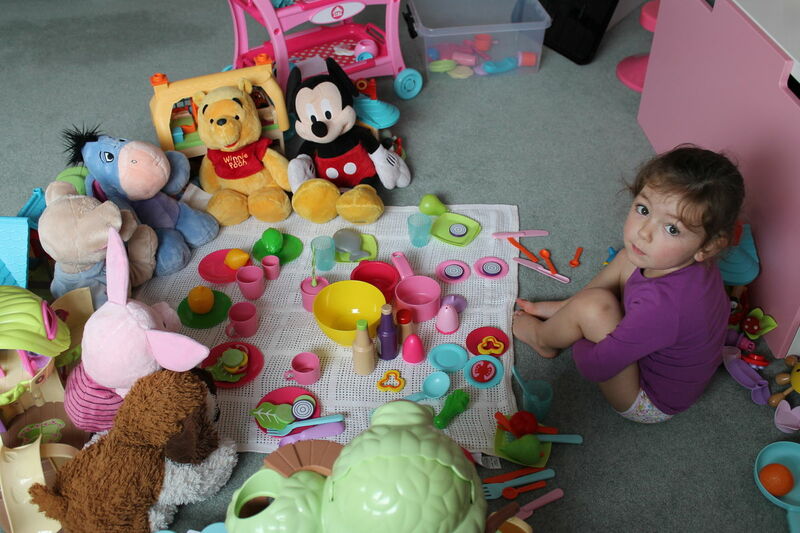 As with most things nowadays, my children pretty much come first, and I wanted her to be as settled and happy as quickly as we could manage for her. In the old house she’d stayed in her little nursery room, and because we knew we’d be moving at some point, we didn’t bother to redecorate it even as she became that little bit older. So, as soon as we had been given the keys for the new house, (and saved some more pennies for a spot of DIY!) 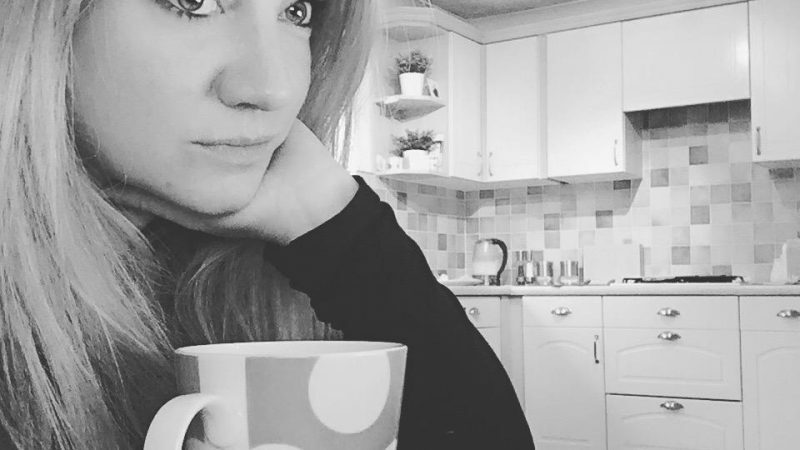 we decamped Holly off to the spare room, while we set to work on her new little girl’s bedroom. The first thing to go was the awful and tired looking dark blue carpet! So, with an element of blue with the carpet, we set to work on the walls. I was keen to bring in another colour or two, so opted for a lilac and pink. And then, with the help of the Next curtains I’d bought in a sale, we brought the blue back in again, so all in all the room seemed to fit together quite nicely. There isn’t particularly a ‘theme’ to the room, but I suppose if I had to describe it I would probably say a kind of fairy/woodland theme. You’ll see more of why a little later! So, with rather a blank canvas as a backdrop, we have been able to add different elements to give it a little more character. 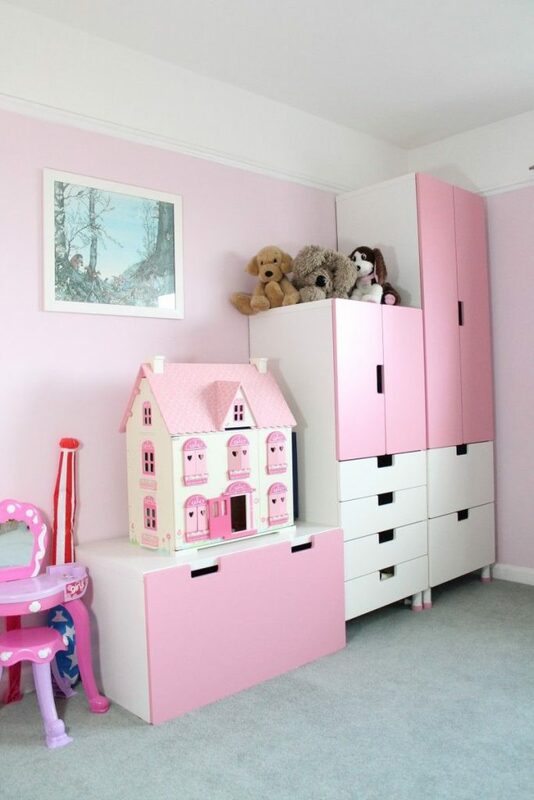 Its most definitely a ‘pretty’ and very ‘girly’ room if you will. Next to add was the furniture. I knew I wanted as much storage as I could, and after looking into various options, the Ikea Stuva furniture range seemed to have everything we currently required, and at a reasonable price to boot. 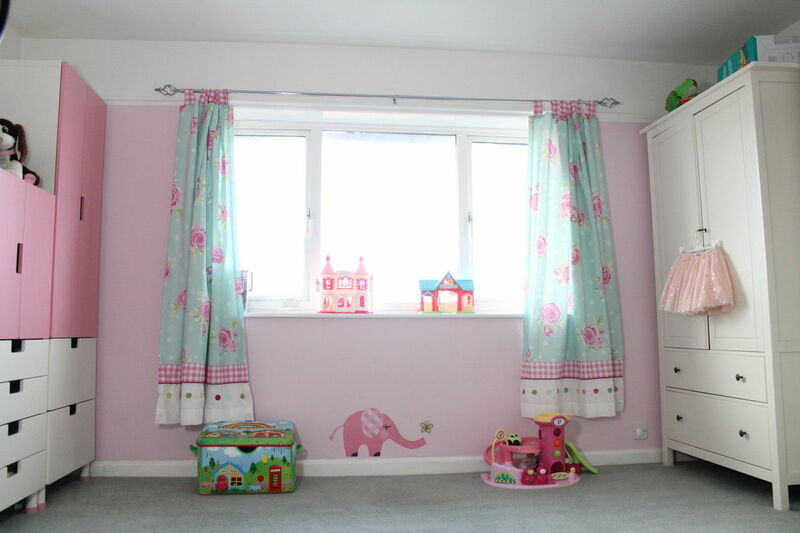 Plus, with the pastel colours – it added a little something to the room also. We bought the Storage Bench and two Storage Combination with doors/drawers. They’ve actually since added loft beds to the Stuva range which I’m sure Holly (and Ella!) would love in the future! The wardrobe, the chest of drawers and the bookcase are all from the Ikea Hemnes range, which I chose mainly because of the storage capacity again (the drawers are wonderfully deep) but also because they seemed a little more classic which I wanted to mix up with the very modern lines of the Stuva. Some may say this doesn’t go – but I think its rather pretty. Holly’s bed was a gift from her Grandparents, with the proviso that it was in white wood. 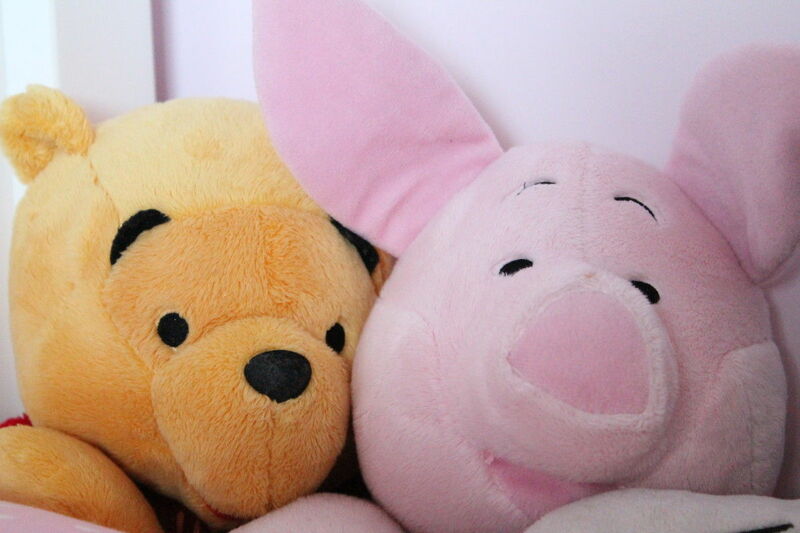 This is now home to most of her teddies! 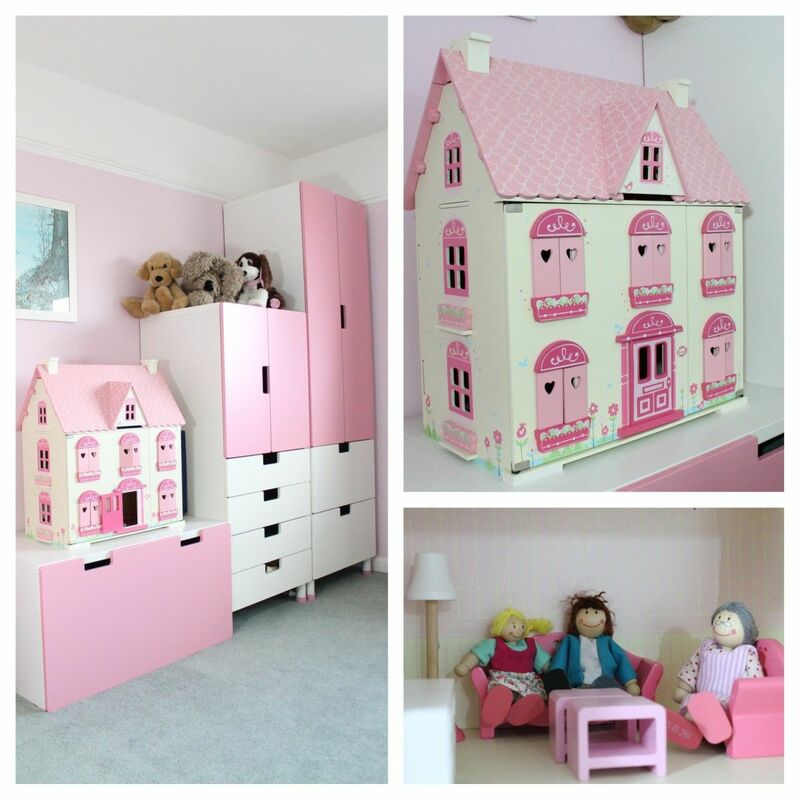 And the beautiful little Rosebud Country Doll’s House by ELC, sits perfectly on the storage bench – the perfect height for the girls to play. The wall stickers I found on Amazon (one can be found here) were a fabulous little purchase. They were really easy to put up, it was straightforward to follow the instructions and they’ve lasted these few years with absolutely no wear and tear! I have since bought wall stickers for other rooms and none have been as good as this set. Since putting it up and all together on the wall, I have had so many people commenting and asking where we bought it from. They’re bright and friendly and are a super cute way of adding a non permanent feature and an extra element of interest and colour to any wall. Thoroughly recommended! Next for some other wall adornments. 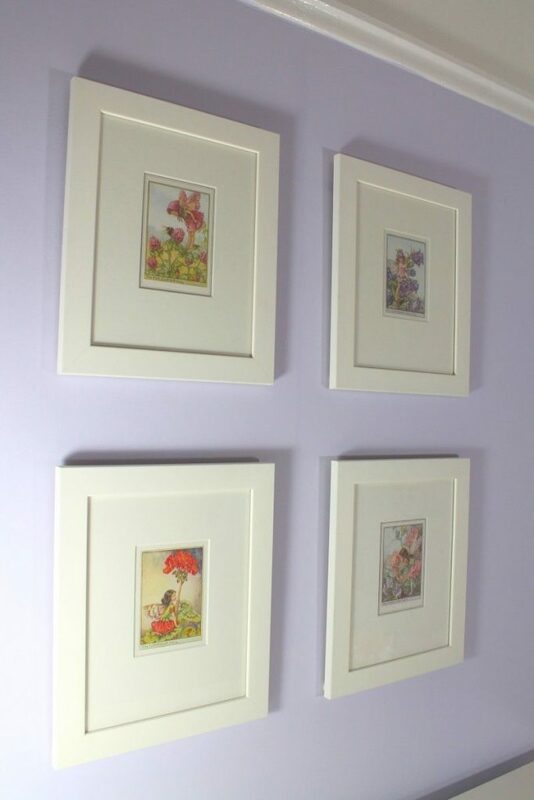 It has been a bit of a family tradition with all the girls in my family and that of my sisters family, whereby each little girl receives flower fairy prints for their first birthdays. So upholding with this tradition, Holly has a group of four flower fairy prints (from Flower Fairies Pictures) which we hung on the chimney wall in the middle of the two recesses. 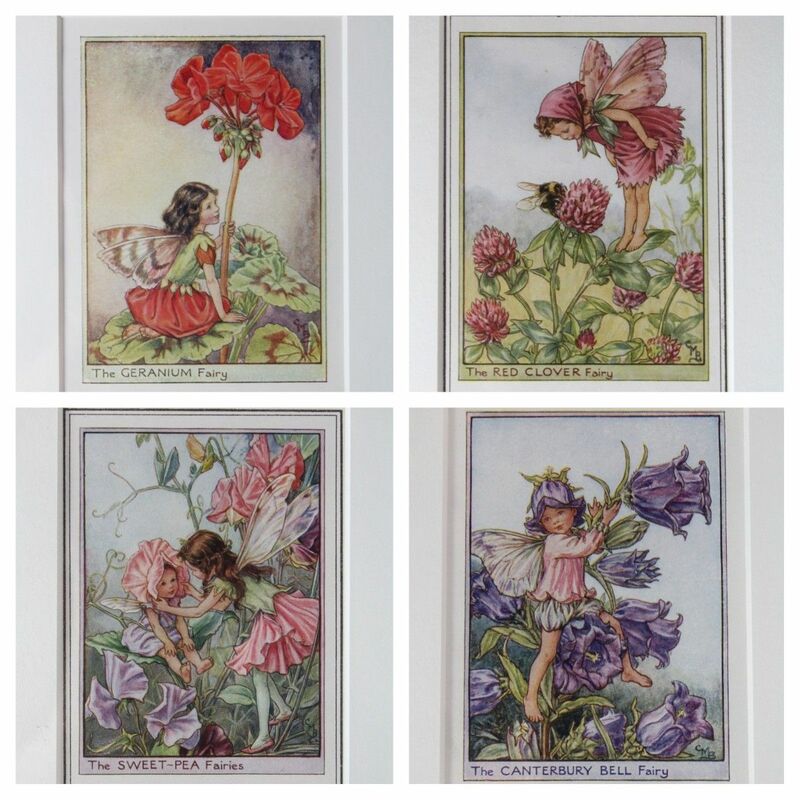 These match perfectly with the coloured walls as they each have purple and pink elements to the fairies dresses. On the wall opposite, she has another picture which was actually mine as I was a baby. It’s a beautiful original Molly Brett (similar prints can be found here) which I was given as a Christening gift from my Grandparents a fair few years ago now!! 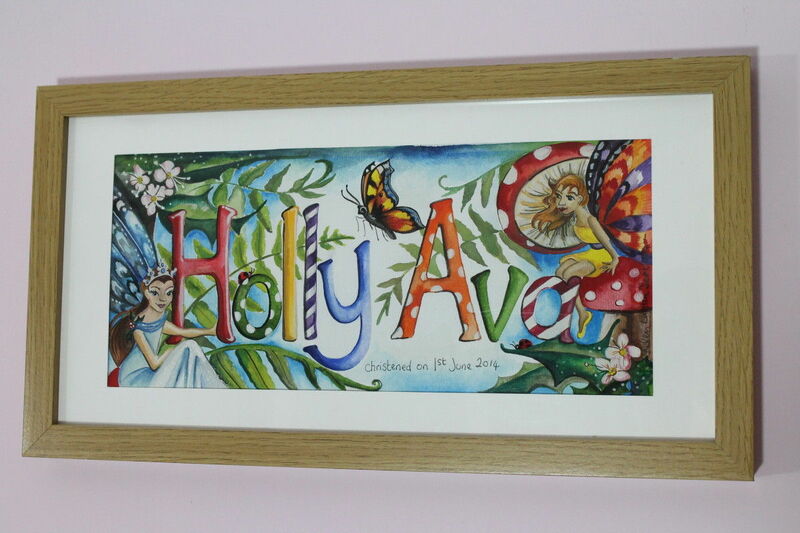 This was a gift from my sister for the girls joint Christening – a hand painted name plaque, designed and paitned by a very talented and artistic friend of ours. 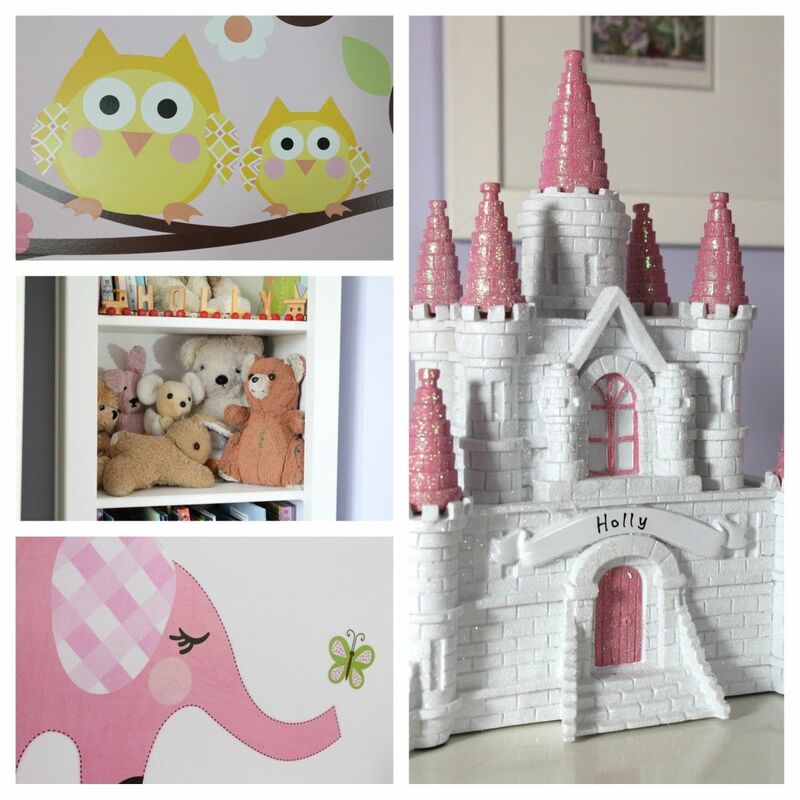 Another Christening gift – a pretty sparkly fairy castle money box from Holly’s Godparents, where you can also see the Hemnes bookshelf – complete with all of the teddies belonging to her mummy and daddy when they were little! 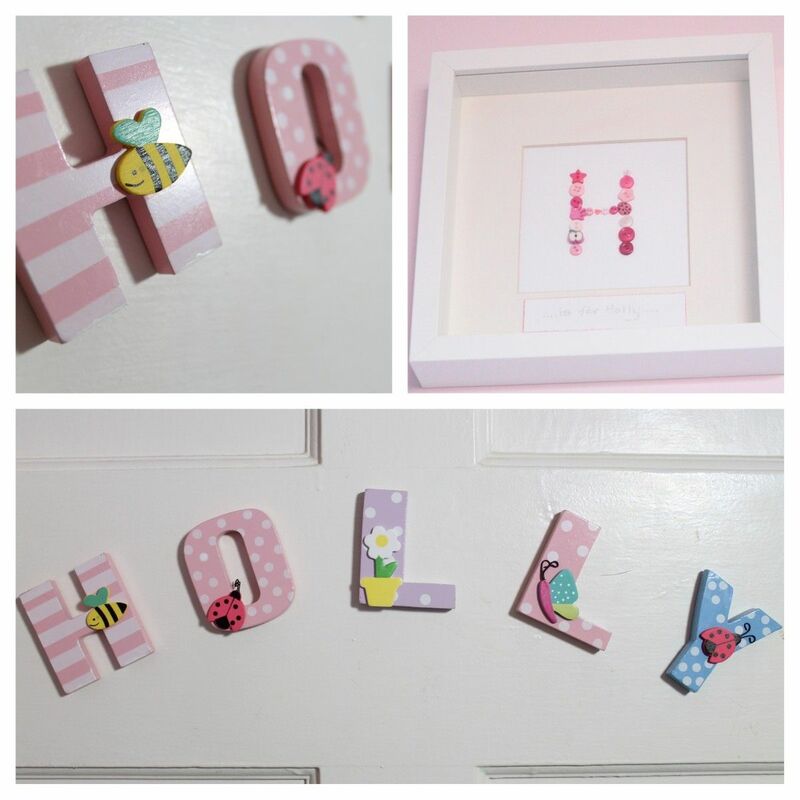 The framed H, crafted from buttons was another gift at their Christening and the ever so cute pastel coloured door letters were from Jojo Maman Bebe. 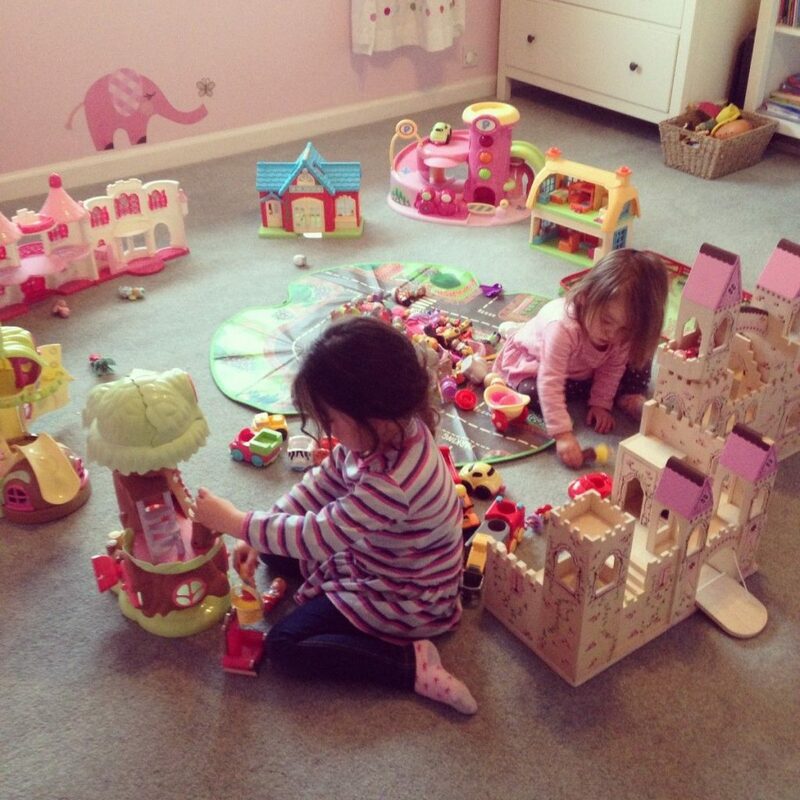 The only thing I want to add now really is a really fun rug – I would love one that has a road network on it, as both my girls love to sit in her room and play towns with the Happy land people! Oh – and a pretty ceiling lampshade. 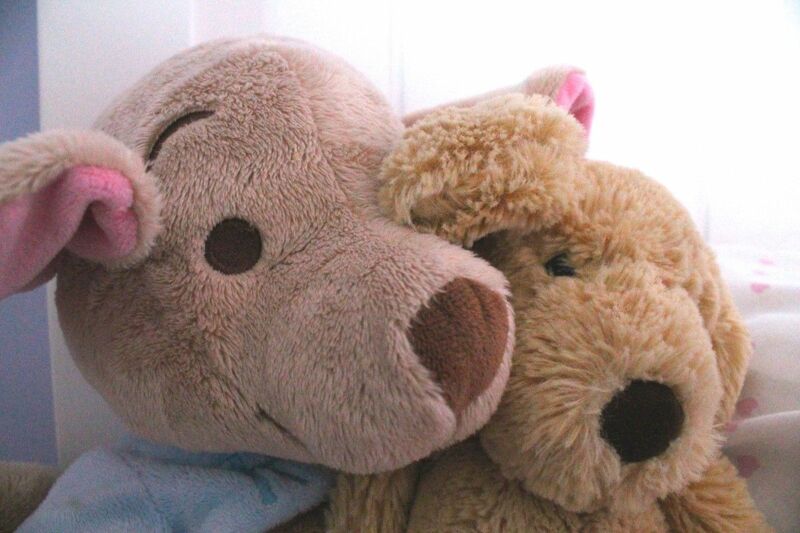 And of course, what little person’s room would be complete without their cuddly friends….. 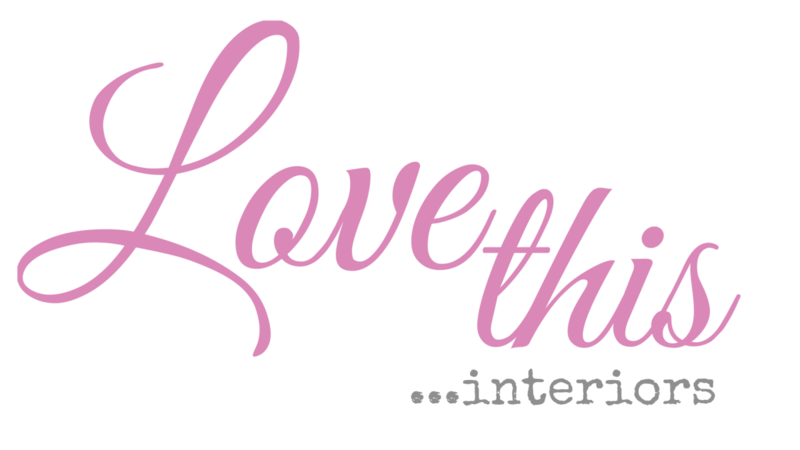 Though I certainly don’t see this scheme lasting forever, especially as I keep seeing too many amazing and beautiful new colour schemes and decorative projects on Pinterest, it works well for the time being. 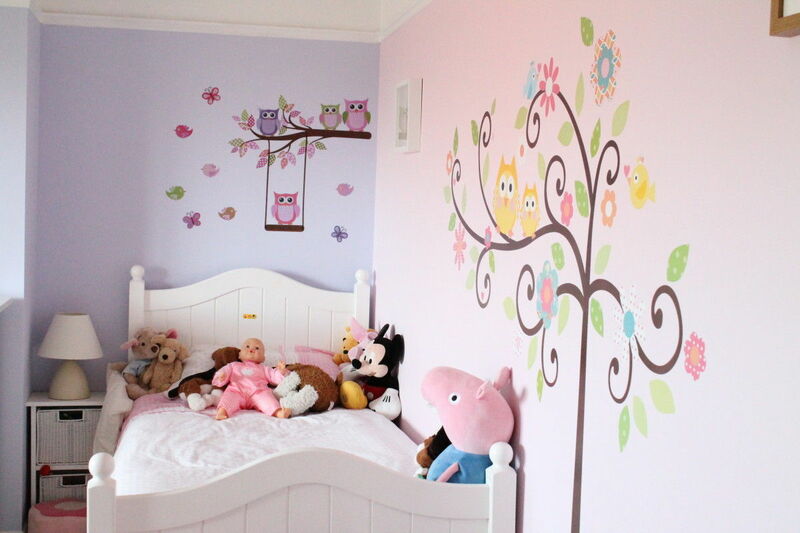 And anyway, I expect this will eventually end up being Ella’s room at the end of this year as we move Holly into the bigger room of the two. And whether we keep it as is for ella only time will tell. Again – it will probably all depend on Pinterest!